Have you ever had a boss or manager who constantly manipulated you? Was your relationship with this boss a good one? A significant part of being a successful leader is being able to motivate others to action and common goals. Successful leadership is never manipulation or coercion – but rather persuasion. When done right, you build trust, respect and rapport and eventually bring others towards your goals. In order to do this, leaders use the power of persuasion in an effort to guide and lead others. But can you distinguish between persuasion and manipulation? 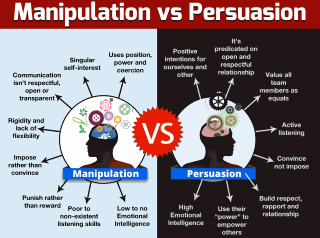 Do you know the differences between a persuasive leader and a manipulator? 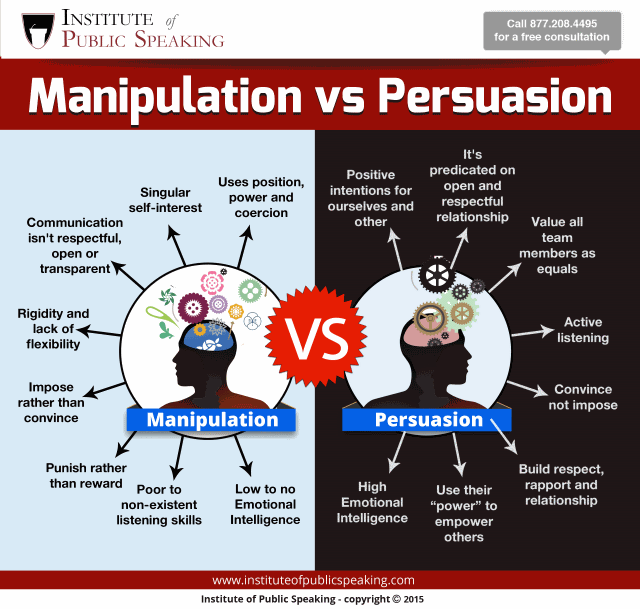 And does being persuasive make you a manipulator? In this post, we will answer those questions, so read on to find out. Manipulative leaders use position, power, and coercion to derive their outcomes. They confuse people for widgets or cogs in a machine. They falsely believe that these manipulative characteristics and behaviors will yield them success. However, the outcomes they see will always backfire in the long run. People will eventually see right through them. The end result will be that the team or organization will suffer a variety of negative outcomes: lack of team cohesion, poor sales results or more substantial business failures. Manipulative leaders do not value or respect those they try to manipulate. Often using their power, position or title to impose their views upon others. This is in part caused by a singular self-interest stemming from low emotional intelligence. Their lacking emotional intelligence is clearly seen within these manipulative behaviors. Another sign of a manipulative person is poor or non-existent listening skills. A manipulator is consistently motivated by egocentricity and tends to not listen (or care about) the views or opinions expressed by others. A lack of listening skills on the part of leader is disastrous to any organization. A manipulator is also unlikely to be transparent and open with their communications. Often making very rigid or inflexible decisions. This is likely to manipulate or coerce others into agreeing with their decisions. This also allows them to impose their views and agenda on others while stifling resistance. It should be clear that manipulation isn’t a sound strategy for long-term leadership success. A successful leader often persuades others to agree with their decision or strategy. This is necessary for them to effectively lead others. However, unlike manipulators, persuasive leaders have positive intentions, not only for themselves but also for others. The intentions of the leader are the key differences between a persuasive leader and a manipulator. Persuasive leaders will understand that everyone is valuable and will respect others. They see beyond position and title. They will demonstrate this in a variety of ways. Such as encouraging others to express their views and ideas and actively listening when these opinions are expressed. They will also be transparent and open in their communication, building trust and a positive rapport. Great leaders are not only persuasive, they are also emotionally intelligent. Showing empathy and diligence when handling interpersonal relationships. They build real authentic relationships which yield trust and respect of others. Others want to be led by them and are inspired to follow their lead. A persuasive leader will use their power to empower others. They persuade others, not for a singular egocentric gain but instead, to help others do what is best for themselves, their team and the ‘greater good’ of their organization. Positive intentions matter to leadership outcomes. If you authentic in your intent on empowering your team or organization to succeed — it will shine through in your actions. The positive, authentic intentions of the leader are oft the birthplace of success. A persuasive leader is trustworthy and will earn that trust by being character driven, honest and transparent. They will authentically build positive relationships and gain the trust of others. Trust will be an outgrowth of the character traits they express through positive actions. Leaders don’t command respect, they earn it. Respect is a hard-fought outcome but it will translate to others in your organization wanting to work collaboratively toward your goals. Gain respect by showing it. Leaders without EI (Emotional Intelligence) is like a car without wheels, no matter how you try, you are going nowhere. Emotional intelligence or EI is our ability to recognize our emotions and that of others and use that information to guild our thinking and behavior. Persuasive leaders must authentic work on developing emotional intelligence skills to navigate the many interpersonal challenges they will face in their organizations & lives. Persuasive leaders know that to authentically listen is a powerful skill. You should attempt to always understand others, truly respect and acknowledge what they are communicating. Authentically and actively listening builds trust and respect with your peers. The persuasive leader doesn’t come from an inauthentic place of manipulation. This doesn’t serve either its practitioner or their organization. Manipulation may drive short term goals but stymies long-term success. Embrace the characteristics of an authentic, emotionally intelligent leader and persuasion will be your natural outgrowth. 4 Responses to "Manipulative vs. Persuasive Leadership"
I am a huge fan of persuasive leadership because I’m direct, but fair. Manipulative just relates to a bad experience for me professionally. Your job as a leader is to bring the best out of your team members without having to have the sale their souls. Thank you for this post. I’ve worked with both Manipulative and Persuasive management and there are definitely some pretty distinct differences. As an employee, I prefer to feel valued for what I bring to the table as an individual. Persuasive managers recognize their employees’ abilities and are much more effective managers. I hope to be that type of manager as I move into more supervisory roles in my career. Another really good post. I see a lot of people being manipulative in the work force. It is almost like these people have it in their heads that they are better than other simply for earning more. I think in most cases, these leaders are narcissists and that is scary. I think that most people can agree that they have worked for more manipulative leaders and persuasive ones. I’m much happier when I work for a persuasive one with the right mindset.